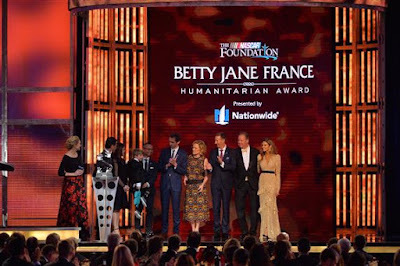 The NASCAR Foundation’s Betty Jane France Humanitarian Award Presented by Nationwide honors the philanthropic ideals and vision of the late Betty Jane France, who started the foundation in 2006. 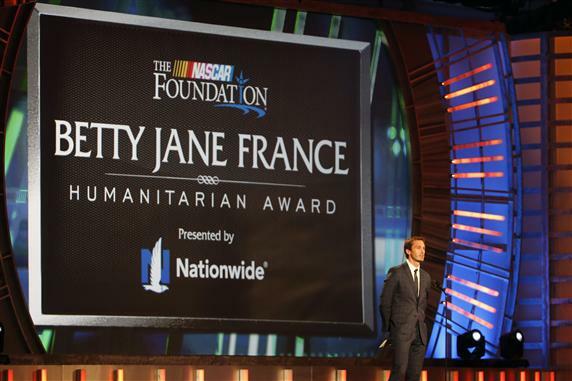 The award is annually presented to a NASCAR fan who embodies those ideals through service in their community. Julian Maha, announced at the Monster Energy NASCAR Cup Series Awards as the winner of the seventh annual award, is a most deserving honoree, with accomplishments that caught the attention of the thousands of NASCAR fans who made him the award winner via an on-line vote on NASCAR.com. Maha, a physician from Vestavia Hills, Alabama, is the award-winning founder of KultureCity, the cutting-edge organization that works to improve the lives of children with autism while also educating society about the inclusion of autistic children. In addition to the award, KultureCity received a $100,000 donation from The NASCAR Foundation, NASCAR’s charitable arm. Maha has a non-verbal autistic son, which inspired him to found KultureCity in 2013. A variety of accomplishments and accolades have ensued. KultureCity – which has been named a Top-10 Non-Profit by Microsoft and the Top Non-Profit in Alabama – estimates that under Maha’s leadership, the organization has impacted the lives of more than 100,000 autistic children. Maha is a past recipient of the Alabama Distinguished Citizen Award; he was named “Top Southerner” by Southern Living Magazine and was a Top 40 under 40 Influencer in 2016. In addition, his Sensory Initiative program – which addresses sensory inclusivity in locations such as arenas, stadiums and other public settings – has been utilized at the Birmingham Zoo and Quicken Loans Arena in Cleveland, and by 12 NBA teams and two NFL teams. “This award is truly an amazing honor,” Maha said Thursday, after accepting the award at Wynn Las Vegas. “This award belongs to all members of the KultureCity family. Maha is a proud NASCAR fan, which makes sense. He lives just a short drive from Talladega Superspeedway. A native of Malaysia, Maha came to Montgomery, Alabama as a teenager to live with his sister, who attended Auburn University on a tennis scholarship. Living near Talladega in true “NASCAR country”, he inevitably became interested in NASCAR, and now, at the age of 40, considers Denny Hamlin his favorite driver. And of course, his favorite track is the 2.66-mile ‘Dega tri-oval. “My initial exposure to the United States in Montgomery was pretty much in terms of through sports,” Maha said. “That was the biggest thing that helped me connect with my classmates. The unifying aspect for me was sports, and it was largely basketball and NASCAR. • Shannon Goldwater of Scottsdale, Arizona, the founder of Feeding Matters, an organization that strives to promote advances in both the diagnosis and treatment of pediatric feeding disorders. • Tammy Richardson of Las Vegas, representing the Nevada Childhood Cancer that provides programs and services to children with cancer and other life-threatening diseases. Richardson is a longtime active volunteer and committee member at the foundation’s Camp Cartwheel. • Two-time cancer survivor Chante Gonzalez Vido of Jamul, California, head counselor at a camp for young cancer patients that is operated by The Seany Foundation, which assists children and their families battling cancer. awards at Wynn Las Vegas on November 30, 2017 in Las Vegas, Nevada. Series awards at Wynn Las Vegas on November 30, 2017 in Las Vegas, Nevada.